This building is a classic example of fieldstone construction in the typical simplicity of most Methodist chapels. The first records of Methodism in Dunham area date from 1798. It is believed that the first Methodist minister to preach in the village was The Rev. Hezekiah Calvin Wooster, an itinerant preacher, who, due to a heavy workload had contracted consumption, and was returning to his home in the U.S. when he passed through Dunham in 1798. The Rev. Lorenzo Dow was another of the first preachers, who was sent, in 1799, by a Methodist conference in Massachusetts to make a new circuit in the northwestern part of Vermont, which included the Dunham area. In Dunham, his first services were in the barn owned by Mr. Gear near Chapel Corner. In 1806, the Dunham Methodist circuit officially came into being under care of the New York Conference of the Methodist Episcopal Church. During the War of 1812-14, Canadian Methodist Societies voted to loosen their ties with the U.S. parent organization and instead receive Wesleyan ministers from Britain. One of these was the Rev. Richard Pope, head of the Montreal circuit, who in 1818 announced the creation of the St. Armand circuit, which included Dunham, as separate from Montreal. In 1839, Dunham became a separate circuit from St. Armand. 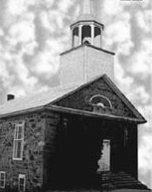 The deed for the land on which the present United Church is built was issued on May 23, 1846, and the owner was Seneca Paige. The Rev. Matthew Lang was part of the trustees. The stonemason for the new church is believed to have been Orange Ellis, who built many churches in the area. By 1850, there were 358 members on the Dunham Methodist circuit communities including: Dunham flat –39; Meigs’ Corner – 16; East Dunham – 34; Nelsonville – 13; Brome – 37; Abbott’s Corner –29; North Sutton –26; Sutton Flat – 32; Hyatt’s Flat – 33; Stanbridge Village – 22; Pierceton – 12; Fordyce Corner – 11; Bowkerville – 17; Stone Settlement –10; Walbridge’s (Mystic) –27.